Walt Disney. MGM Studios. Universal Studios. All the best movie studios and production houses have embraced monkeys at one point or another! Why? Simply, they are entertaining. We have been intrigued by monkeys, and they have been used seemingly forever. Who are they, where can we find them and why is one of them watching TV inside the book? 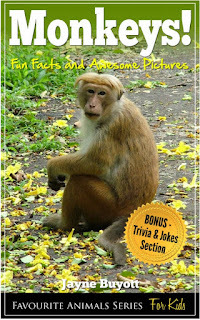 This kids reader, with many amazing pictures, aims to answer these questions, and to explore the wonderful world of monkeys! Enjoy!